What do Vegans eat? Feast your eyes on my veg! Although there are fortified foods available for vegans, from what I have researched it is good to take a vitamin to supplement certain nutrients that are probably lacking in most vegan diets. (Vitimin B12 is probably the most common, as it is mostly found in animal products). 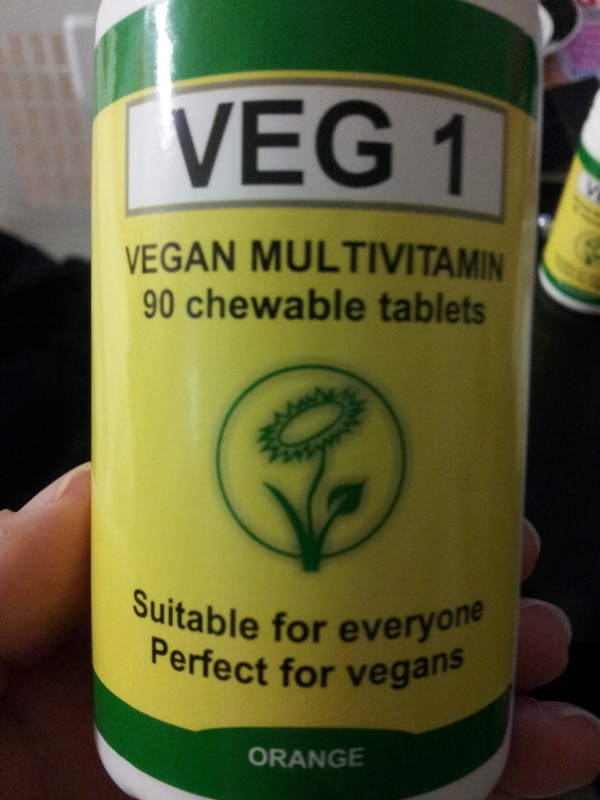 I recently ordered a vitamin specifically for vegans, and it was quite cheap! It is called Veg 1, formulated by the Vegan Society in conjunction with HealthPlus. For a 90 day supply, after shipping from the UK (far from me!) it worked out to be around $14 I think. I ordered two, and I like the orange flavor the best. Do you take any supplements on a vegan diet? Follow Feast Your Eyes via Email! Do you prefer following FYE on Bloglovin’?